Wireless CCTV Ltd (WCCTV) is the market leading provider of redeployable CCTV, site security, body worn cameras and time lapse video services. 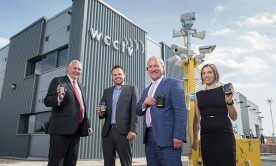 WCCTV’s systems transmit live and recorded images over wireless networks including 4G and 3G mobile networks, plus satellite, Wi-Fi and broadband. WCCTV's systems are designed for rapid deployment, and are ideal for temporary, mobile, semi-permanent applications or remote applications. WCCTV prides itself on providing unrivalled customer support, and focuses on continual technical product development to meet its customers changing requirements. Wireless CCTV’s customer-focused mobile surveillance systems are utilised by leading local authorities, police forces, housing associations, train operating companies, construction companies, utilities providers and contractors, as well as commercial organisations and integrators. The Company provides covert, overt and bespoke systems on a sale or rental basis, and can provide standalone products or deliver a fully tailored and managed service package to maximise your usage of the systems.